I’m not cooking or baking as much as I’d like and that’s mostly because I’m dealing with unpleasant physical issues related to my least favorite of my chemo drugs. [I know that the last infusion was almost 6 weeks ago, but please tell that to the drugs…] I met with my oncologist this morning and he hasn’t seen it before in his many years of poisoning cancer patients. Great! I’m exceptional in every frakking way… Meanwhile, it would seem that all of my medical appointments have piled together lately such that I fell asleep on the table last night during my heart scan. Well, I’d rather sleep through Journey wailing over the speakers than listen to it while isotopes go racing through my heart. Yesterday evening as Jeremy drove me to my heart scan down on the flats, I spied some mammata forming in the distance. 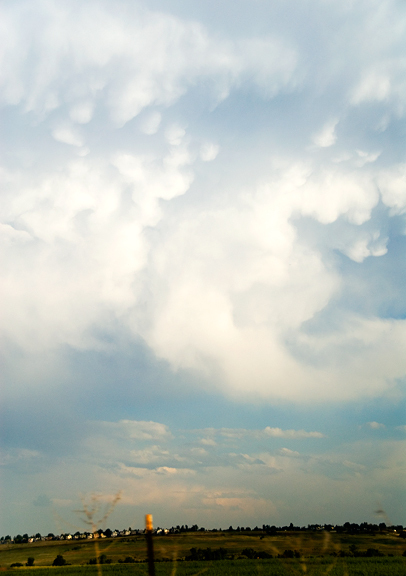 Mammata clouds are typical precursors to tornadoes. In very simple terms, they indicate instability in the atmosphere. We see a lot of them in the summer around these parts. The breast-like shape of the clouds is where the name comes from, but a few years ago I was hiking with 5 female atmospheric scientists in the Rockies when we spied mammata forming in the sky. They insisted on referring to them as testicular clouds. So there you have it. I just think they’re very cool (both the clouds and the female atmospheric scientists). We had a wonderful, albeit short visit with my aunt and her family over the weekend. Everyone enjoyed the time spent together, particularly Kaweah because she received 150% more attention and love than usual. 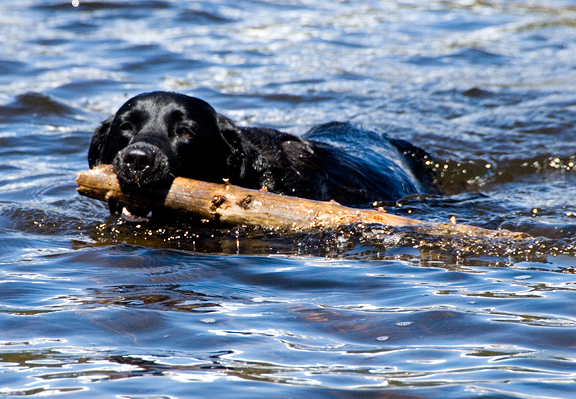 She also found a nice big stick to drag around the lake. The weather has been getting warm as summer fast approaches our corner of the globe. Although it is usually cool enough where we live that baking in the oven doesn’t make me homicidal, there is nothing quite like serving up homemade ice cream to cool off in the afternoon heat. While Jeremy’s requests usually center on one of three caffeinated flavors (chocolate, coffee, or matcha green tea), I had summer on the brain. I am so enamored with David Lebovitz’s custard-based ice cream recipes from The Perfect Scoop that I had no choice (no choice!!) but to try his recipe for raspberry ice cream – except I subbed blackberries for the raspberries so I could make the stains on my t-shirt even more permanent. David suggests 6 cups of fresh raspberries to yield 1 1/2 cups of raspberry purée. 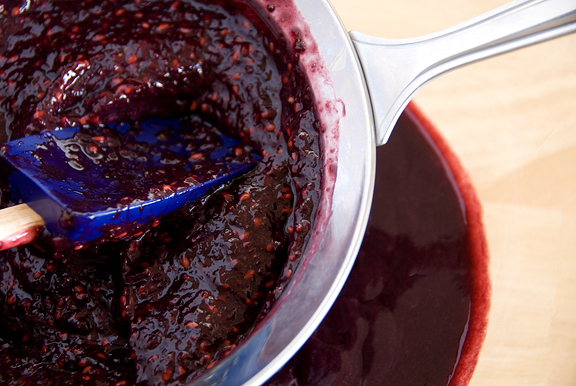 I used 6 cups of blackberries and I can assure you that you only need 4 cups, tops. I also realized that what has been missing in my life is a food mill. I served the ice cream to our guests over the weekend and heard a lot of mmm mmm mmming. It’s a smooth and rich treat to be sure. 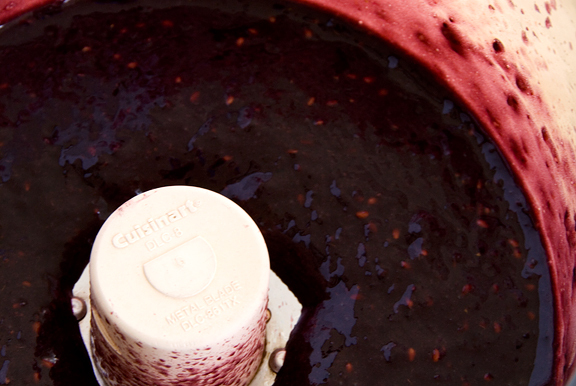 The quality is entirely dependent on your ingredients, specifically the berries. So be sure to procure some damn tasty berries to make it worth the effort. It’s a gorgeous color, no? Warm half-and-half and sugar in medium saucepan. Pour cream into large bowl and set mesh strainer over top. 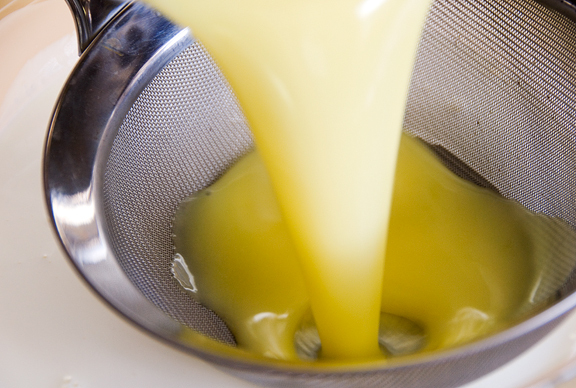 In separate medium bowl, whisk together egg yolks. 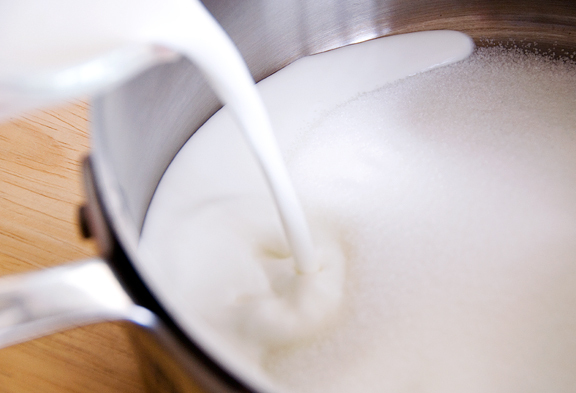 Slowly pour warm milk into the egg yolks, whisking constantly, then scrape the warmed egg yolks back into saucepan. Stir mixture constantly over med heat with heatproof spatula, scraping bottom as you stir until mixture thickens and coats spatula. Pour custard through the strainer and stir into cream. Mix in purée and lemon juice then stir until cool over ice bath. Chill thoroughly in fridge and churn ice cream according to ice cream maker’s instructions within 4 hours after making mixture (to preserve the fresh berry taste). Makes 1 liter. Ooh, love that swirly ice cream shot. 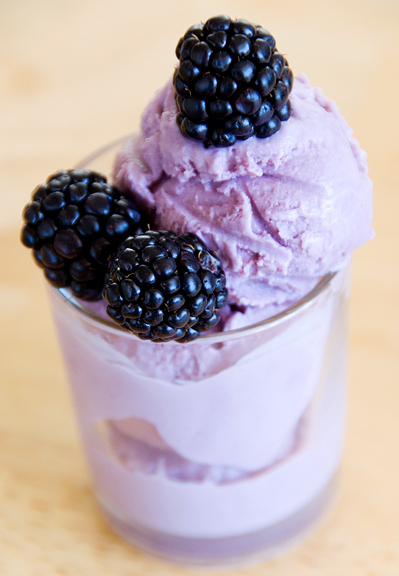 Those berries look fabulous, and I love the purple colour they become in the ice cream! Testicular clouds, breast clouds – and I thought “cumulo-nimbus” was a funny word! Mmm, blackberry ice cream is so wonderful. I made some awhile back. Sorry you are still having side effects. Oh, I really enjoy your posts! And your dog with large stick-log! 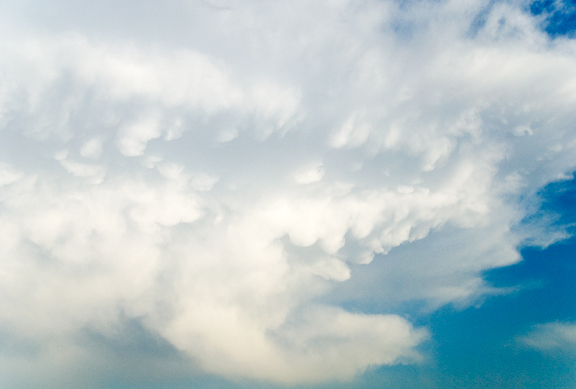 Can there be testiculambus clouds to match with the mammata clouds? But that might create some really nasty tornado spawns. Ah, nature. Hope those side effects go soon. I’ve still got one of my side effects (numb toes) 18 months down the track. THe ice cream looks stunning. I grew up on a farm with an enormous blackberry bush. My clothes were constantly stained. Lovely photos of the scenery, doggies and yummy ice cream. I hope you feel better soon and aren’t so “exceptional” in the eyes of your doctor. best wishes to you. Cool cloud shots. The ice cream looks amazing… there is something so delectable about berries and cream. Love all the pictures and the storys behind them. Now I want a scoop of ice cream. The ice cream looks beyond fantastic. I thought it would come out a rose-y color, but I wasn’t expecting a bluish ice cream! (I wonder if it’s because of a pH change…) It’s very appealing. I’m guessing frozen berries are okay since they’re supposed to be picked at the peak of freshness. I only have a handful left, though, good only mixed in with other fruits (in maybe pie, or as a sauce). I used a blender to puree mine from before, and even the seeds got processed. Smart. It was really thick and what was left in the sieve was a weird, nutty mass. So much pectin went into the puree itself that it turned into jam in the fridge, lol. Food mill! Yaaay! 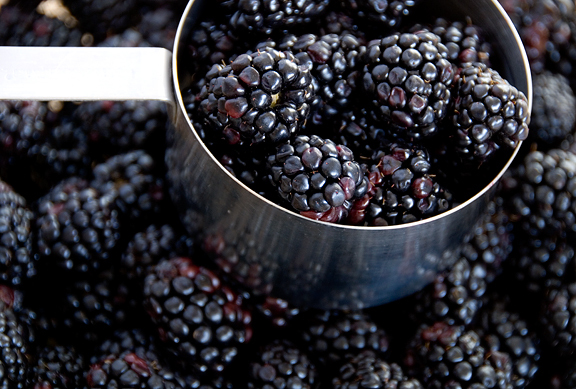 OMG, blackberries are some of my favorite berries! That ice cream must be delightful! Oh this is absolutely gorgeous! And I am so jealous about you living in Colorado… I lived in Denver for 3 years before moving to Florida… I miss it so very much, especially now. Gorgeous photos! That ice cream looks marvelous and be still my beating heart – no ice cream maker!!! I can actually make this one! Hurray! I been gone for awhile… on vacation… came to check out your blog and saw the Ice Cream… OMG looks SOOOOO good… Now I have to stop on my way home from work and get ice cream, thanks!!!! Don’t you know? Exceptional women get winks from men half their age all the time… snort. I got an ice cream maker for my kitchenaid for christmas and i am yet to ues it however it is in the freezer waiting for me. i have made the custard base ice cream before and i am sure berries are great but i am thinking less fat for my first try. yours looks wonderful and i really want a bite even if the berries were not at the peak or perfection. Yes…you are exceptional :) so is this ice cream! What a great picture! That last one is sending me vibes….good ones! Hope all the tests and crummy side effects are over soon! To rid yourself of raspberry and blackberry stains (especially if still relatively fresh) hold garment over sink and pour boiling water through. Magical, how they disappear. Here’s hoping for the best of health … in the very near future! Ugh, hope the long-lasting chemo side effects go away soon…don’t they know they have WAY overstayed their visit? Hope the rest of radiation goes smoothly and without any major side effects. I hope you start feeling better soon, Jen. Truly do. That ice cream is beautiful, I love its color! So delicate. I love blackberries and I love ice cream. This looks divine! Those photos are just amazing! And the ice cream looks dreamy! The photos ara amazing and the blackberries ummmm!! I love David’s book and this ice cream is so good. Duh to me for not using other berries. I love you for reminding me! I was just thinking I have blackberries to use up and wouldn’t ice cream be nice. Thanks for the recipe now I don’t have to look through his book. Those photos look spectacular! And I also love David’s book. This looks fantastic, but now my thanks to you (and Peabody) I’m forever going to have that image in my brain as well. Loved all the pictures! love the colors of purple and black….so dramatic! That is just lovely. The one with the puree being stirred in is especially drool-worthy. We have an ice cream manufacturer here in San Jose that makes the most awesome black raspberry marble ice cream. I’m gonna have to have some now! david lebovitz’s ice creams are the BEST. i made the passionfruit over the weekend and it is killer. also, more cute dog pictures, please. That purple ice cream looks lovely! And the photo of Kaweah with the stick so cute. That ice cream looks amazing! I’ll have to drag out my machine and try your recipe. I went crazy with homemade ice cream about a year ago and then sort of burned out on it. Husband will be happy. I can’t believe you’ve lived this long without a food mill! They’re the bomb. Nothing better for making mashed potatoes or pureed squash. Also can’t believe you’ve got that much snow hanging around. I’m limp from our heat. Jen – What a gorgeous day you had by the lake. I love the photo of Kaweah with the stick too. You know, the other day, as I was riding the bus to downtown, a thuggish high schooler rapped a short song (with special sound effects) for me. It was very much a WTF moment. And, I assure you, I didn’t find it *not* flattering. Anyway, blackberries are one of my favorite fruits. They can have such intense flavor, although they can also be a mess dealing with (been there too!) Your ice cream looks so delish – I’m going to have to make some now. I am going to make that ice cream OMG. Do those blackberries sticking out of that cup (last photo) look like mammata to anyone else but me? Last guy to wink at me was a geezer at church. Feel better soon. Don’t take this the wrong way, Jen, but it’s hard for me to believe you’re dealing with unpleasant and tiring treatments when I see you’re still making awesome creations in the kitchen and taking such gorgeous pictures. Girl you’re unstoppable! All best wishes, hugs and kisses. Zoe/puku – I wish I could have procured some blackberries from the road. I’m sure they would have had more flavor to them. I wanted the strain the puree because I wanted the ice cream to be uber smooth. Micka – ha ha ha! That’s a great joke ;) thanks so much! Food Librarian – thank you, you’re so kind. Pam – you nailed it!! 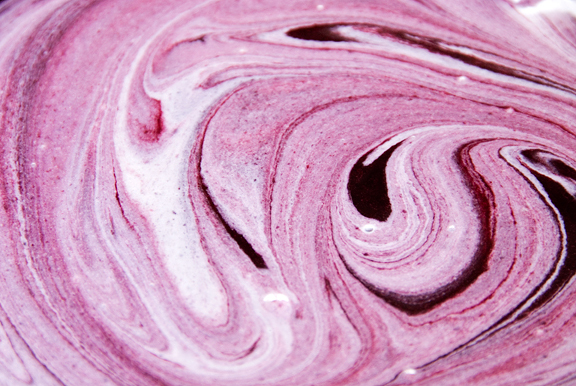 Megan – me too, the purple swirl was such a nice surprise! Mark – hee hee, I don’t think anyone in Boulder (except a few of my friends) knows about URB :) Although folks have asked me on several occasions if I am Kylie Kwong! Yeah, I love the deep color of the ice cream. Can’t wait to experiment with a food mill!! Rosa – thank you for the award, dear! You are such a sweetie. Joanne – sorry love, I did use an ice cream maker for this one, but… you can try it without an ice cream maker! Woolly – hey there, pal! Good to have you back and I hope you had a nice and restful vacay! Mollie – ha ha ha, that’s a good one. Thanks for the good wishes! Shayne – I’m sure you can replace the cream with half and half or something? Tartelette – if I am exceptional, it can only be because I am in exceptional company like yours! Cicero – what a great tip! Thank you!! Amy – chemo doesn’t have manners, apparently ;) I wonder how many people swore and made a mess with their spatulas and sieves before making the plunge for a food mill? Thanks – I hope to be clear of side-effects some day. DivaDivine – you’re sweet – thanks! Meeta – isn’t that book awesome? David is a love. Can’t wait to see what you come up with next! Peabody – you are such a goofball! Farida – I think you might be able to try it without an ice cream maker? Steamy Kitchen – it’s stylin’ just like you, hon! Michelle – omg, where on earth did you score passionfruit?!?! I want. The dog will try to oblige! Christine – those WTF moments of ours are better than other WTF moments I’ve had ;) hee hee. I think that is the prettiest ice cream I’ve ever seen! The color is just lovely! We’re not getting good blackberries here. At $4 for a 1/2 pint, you’d think they’d be awesome. I’m still hoping, though. I’m sorry you’re still feeling poorly. Hopefully, things will get better soon. I NEED to get an ice cream maker!!!! Can a drug come back six weeks later to haunt ya? That’s scary. Tell your Doc to take extra care of you!! Or else there’s a whole world of food bloggers ready to attack! Now that can be really scary! Kaweah, you are growing so much! You definitely look like your’re in your element there. Can you teach Dante some fetching skills? How bout swimming? 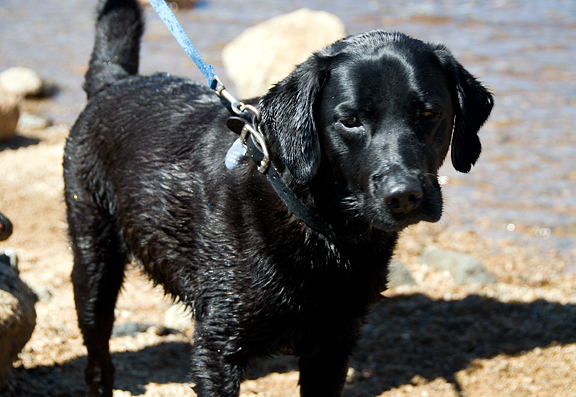 Your ma can teach us how to ski and you can teach our dogs how to swim! Hello Auntie and guests! 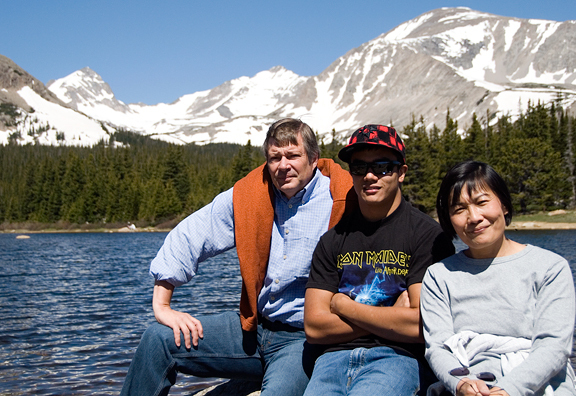 Hope you’re having a great time in Colorado! We wish we could be there too. Hopefully we’ll be driving through there for our road trip next month! Maya – I don’t know that anyone needs an ice cream maker, but it sure is a lot of fun :) hee hee. Thanks for your sweet wishes. Caroline – berries should be in better ripeness now, so I hope it works for ya! I have some wild blackberries growing behind my house and I cant wait to make this ice cream!!! Thanks so much for the recipe. I was looking for a strawberry ice cream recipe for my friend, and decided to adjust this one with strawberries instead of blackberries. amazing!!!! thank you so much for your recipes! I love this recipe. I just got a KitchenAid ice cream maker attachment and I cannot wait to try this. I’m currently living in a place where there’s no room for a food processor lol… Does a Magic Bullet work? Rachel – oh, I don’t know, I’ve never used one. It couldn’t hurt to test it on a few blackberries and see if it purées well enough?